Pro-Democracy Party Slams Communist Party 'Brainwashing' in Hong Kong Textbooks - Integration Through Media ....! 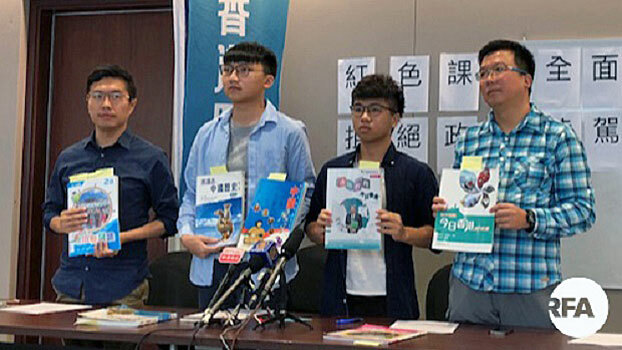 A pro-democracy party in Hong Kong has hit out at newly published school textbooks backed by the Chinese government as “biased,” and aimed at “brainwashing” students. The books and teaching materials published by Educational Publishing, which is wholly controlled by Beijing’s Central Liaison Office in the city, contain a biased account of the 2014 pro-democracy Occupy Central movement, according to activists who led the movement. According to Demosisto committee member Isaac Cheng, a history textbook published by Marshall Cavendish describes Hong Kong as being “occupied” during British colonial rule. He said the 1919 student-led May 4th movement protesting against the Chinese government’s weak response to the Treaty of Versailles that handed territory in the eastern province of Shandong to Japan had been misrepresented. “For example, there is a sentence added in at the end which describes the May 4th movement as a patriotic movement close to Chinese people’s hearts, but makes no mention of the emphasis in the May 4th movement on fighting for democracy and westernization,” Cheng told RFA. “This is a deliberate bid to cater to the government view [of the era] and to stir up students’ emotions,” he said. “They refer to the period of British rule as one of British occupation, which is exactly the same as Chinese officials insisting that China never gave up sovereignty over Hong Kong,” he said. The Kowloon peninsula was added to the colony after the Second Opium War (1856–1860), while the New Territories were added under a 99-year lease that expired in 1997, when Hong Kong was handed back in its entirety to become a Special Administrative Region of the People’s Republic of China. But recent interventions by Beijing in the political and cultural life of the city, including edicts from the National People’s Congress that resulted in the disqualification of sitting lawmakers and potential election candidates, have led many to conclude that those freedoms are likely a thing of the past. Council Front lawmaker Au Nok-hin agreed with the party’s assessment of the textbooks. “Everyone can see that certain textbooks and teaching materials within our education system contain political judgements, and that this isn’t transparent,” Au told reporters on Friday. “We call on the education department to make public the names of those who were on the curriculum drafting committee, and whether or not they are sufficiently qualified to be reviewing teaching materials,” he said. “Even the most basic primary school materials have started to get red-washed, and they don’t really need much analysis at that foundational level,” he said. “I think this is a slow, incremental and pervasive attempt at brainwashing … they won’t even need to implement ‘national patriotic education’ because it has already gotten into the textbooks,” he said. In 2012, proposals for patriotic education in Hong Kong’s schools were shelved after thousands of protesters camped outside government headquarters for several weeks, dressed in black and chanting for the withdrawal from the curriculum of what they called “brainwashing” propaganda from the Communist Party. Student activist Joshua Wong and his Scholarism group, which spearheaded the “anti-brainwashing” campaign, went on to play a key role in the Occupy Central democracy movement two years later. Law returned just five months later as the youngest-ever member of Hong Kong’s Legislative Council (LegCo), but was later stripped of his seat after Beijing intervened with a ruling on the validity of oaths of allegiance made by him and five other pro-democracy lawmakers. Chow, also a veteran of the Scholarism movement, was debarred by election officials from standing in the 2018 Hong Kong Island by-election, for advocating self-determination for the city, in a move that was widely condemned as a threat to the city’s political life.